Top Notch Material: Bild+Animate kit from OgoSport Makes an Awesome Gift for the Creative Minds in Your Life! 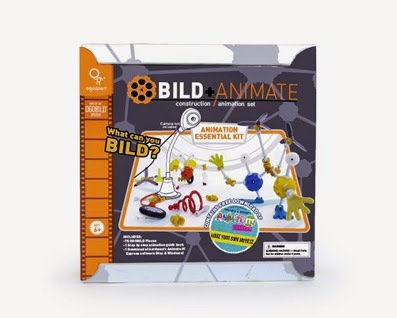 Bild+Animate kit from OgoSport Makes an Awesome Gift for the Creative Minds in Your Life! Our little boy is obsessed with watching YouTube videos that others create. He is often asking us to make videos of him playing with his dinosaurs or his video games. So, when I was contacted about the Bild+Animate kit from OgoSport, I knew it was something I had to check out for him! Essential Kit Build, Create and Animate! OGOBILD is a line of creative construction toys created to promote open-ended play and stimulate a child's imagination. This kit contains Animate It! Express software, which was developed with the Aardman Animations studio (the creators of Wallace & Gromit and Chicken Run) and is the premier UK education stop-motion animation software. Teaches the basics of stop motion animation. Allows kids to make their own animated movies with Animate It! Express. Share finished films with family, friends, and the world! This kit is right up my sons alley because he can be as creative as he likes with building characters. We did have to helps him somewhat, because he is only seven and needs a little assistance figuring out which parts fit together. After a little while though he got the hang of it, and was flying through the process of making characters. While the kit we received did not offer the camera, we have found using our web cam works just as well. I wish I could tell you that we have a masterpiece movie to show off, I have to tell you it is still a work in progress. There is a definite learning curve, but this is incredibly fun for us all, and has kept my little man focused for hours at a time! He is thrilled to be able to "make movies!" It is totally fun just playing with the creatures and making different quirky looking characters too. This is definitely a gift to consider if you have a little one that is fascinated with making movies like I do. It is for ages 6+ and is available with and without the camera! It is available without the camera for $35. You can like OgoSport on facebook to stay up to date with the latest products available!